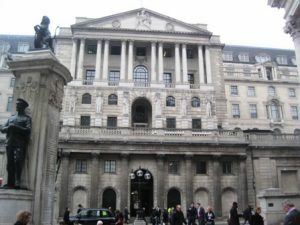 The Bank of England is the central bank of the United Kingdom and is located on Threadneedle Street in the City of London. Its responsibilities include issuing banknotes, raising funds for the government, managing the country’s foreign exchange reserves and setting interest rates. The bank was established in 1694 to provide private funding for William III to rebuild the navy after a crushing defeat by the French at the Battle of Beachy Head. William realised that there were insufficient funds for the task in the government coffers, however a merchant called William Peterson devised a plan: the government of the day gave a group of rich individuals control of the government’s properties and gave it the exclusive right to issue bank notes. In return this group – the bank – gave the government bullion and notes which were used to rebuild the navy. The effect of all of the work that the scheme generated was to transform the economy and reinstate England as a global power. The bank’s current building has grown over the years. It was designed by Sir John Soane to give an impression of security – from the outside the bank is a massive and imposing edifice resembling a fort and has no doors or windows at ground level apart from the main entrance. The bank moved to the new building in 1734 and this first ever purpose-built bank was subsequently slowly rebuilt and expanded in stages with the acquisition of neighbouring land and now occupies more than 1.5 hectares. Halls and courtyards were added which were noted for their drama of light and shade. The grandeur of the halls was intended to impress, while transactions were conducted at more practically sized counters. The Bank of England Museum sets out the history of the bank from its creation to current times. Displays include old coins, designs for banknotes, techniques for deterring forgeries and a 30 pound gold bar which visitors can try to lift (off the ground). The Bank of England Museum is open to the public from Monday to Friday and entry is free.